I am super excited about this book! I rarely read a book twice – this is one that I will keep in my living room to pick up again and again and again … the photographs are priceless and the poems are meaningful treasures. Janelle lives in my area and I’ve had the honor of connecting with her a couple times over the past few years. This is a woman with depth and authenticity! Though I’ve had other losses, I haven’t lost a spouse, but I connected with Janelle’s honesty and clarity about the questions she asked and the emotions she experienced during her journey of grief. And I’m convinced most people on planet earth will connect with it because we all ask questions (and if you don’t, you should!) and experience loss at one time or another. fly off in every direction. Questions have been a big part of Janelle’s journey and her autograph in this book says – Honor the Questions. Here are some lines from her poem called Questions. into the soil of our lives. is worth the risk of inquiry. She doesn’t offer answers and reasons – because life (and death) generally doesn’t offer them. As the book records her journey, you learn with her as she searches. that was given me to be. the deepest me remains unknown. Before this book, I rarely read poetry, but Janelle’s writing has changed that. These poems are wonderful – the style and words she chooses makes them a pleasure to read or hear. Last year, Janelle began doing public readings and I had the honor of being a part of the first one. The event was part of ongoing monthly series where someone shares their life story – always in story form. So doing an evening of poetry reading was new. Of the seventy or so people there, most were not sure if they’ll enjoy it. They were all pleasantly blown away by the evening – seeing Janelle’s photos on a large screen as she read her poems. Her reading voice is very moving -her website contains information about Seasons of Solace Poetry Readings for you and/or your organization. Janelle is now a consultant, retreat leader and spiritual director. You can learn more about her and her work at Journey Through Grief. You can read more about Seasons on Solace on Amazon and if you aren’t the winner of this one – you will want to buy yourself a copy. 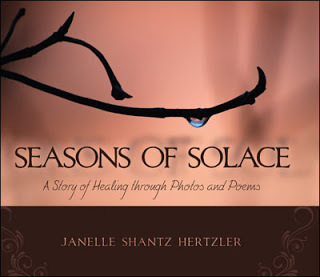 Or if you are local – Janelle will be at iHope on Friday evening to autograph and sell copies of Seasons of Solace. I am so happy Janelle recorded her journey in this way and is sharing it with the world! I will be giving copies to others that have questions and/or are dealing with loss. Leave your name before Thursday 25th at 9PM and you could be the lucky winner! Winner will be posted on Friday morning. ← Are You Being Kind to Yourself? Great review – definitely makes me want to read it (and hopefully I'll be able to, soon)! I heard you speak at Neighbors yesterday and just started following your blog. This book sounds really good and I'd love to hear her do a public reading. I remember hearing about her husband's death, but hadn't heard anything about Janelle lately. Thanks for reviewing it. I discovered, or rediscovered, poetry last year. Reading it forces you to center and listen. Best of all is to read it aloud and "hear the music." I was anxious for this book to come out and just don't have the money to purchase it right now…. so here's hoping!!!! A book for whoever wins it to treasure. Wanted to be sure I didn't miss registering to win this very special book! Thanks for entering … wish I had a book for each of you 🙂 but I only have one, so check back on Thursday. I have three more entries from people that emailed or FBooked me to enter. Congratulations Marty Tousley – you are the winner of Seasons of Solace.